The Rock Island Railroad Branch through Abilene was originally constructed in 1887. The depot, now owned by the Abilene & Smoky Valley Railroad, was originally built in that same year on the north side of the tracks near it’s present location. It was built by a contractor by the name of Mr. Rains of Clay Center, Kansas. It is a wood frame structure approximately 22' by 110'. It contained three rooms, the first from the west was a lady’s waiting room, the second or middle room was the agent’s office and ticket office and the third room was the men’s waiting room, This latter space was just recently converted to men’s and women’s restrooms. At the east end of the building was a very large freight room that will be converted to a railroad museum. The depot was no longer being used by the railroad and was moved to the south side of Fifth Street to make way for the Eisenhower Library & Museum. The outside of the building has received a new coat of paint to help preserve the building. It still has all the original woodwork and stained glass windows above the doors and windows. 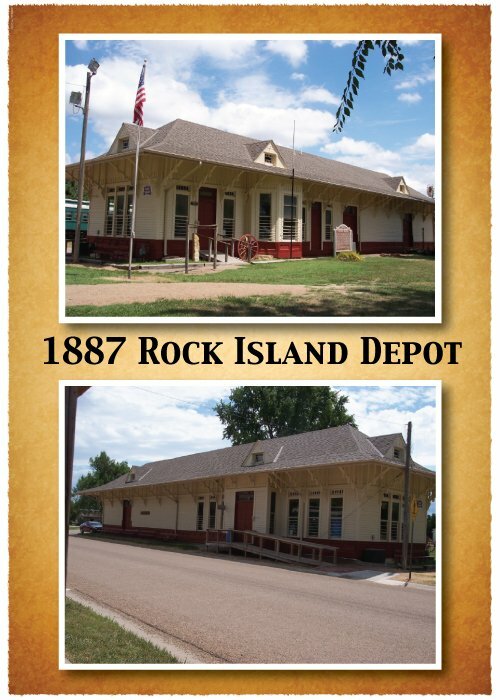 The 1887 Rock Island Depot is now on the National Register of Historic Places.